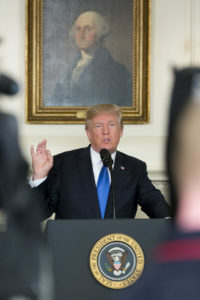 United States President Donald Trump has a message for the world: Iran is a threat and so their regime should be isolated by the other nations to curb their aggression. The same day, that same government singled out by Trump for sowing “chaos, death, and destruction”—Iran—pointed the finger at Israel as the planet’s greatest danger, while also slamming the US and rejecting all bilateral talks with the Americans. Trump, in his speech on Tuesday at the United Nations General Assembly, unleashed a torrent of negatives about the Iranian regime, especially on how they used the supply of funds released to them in the nuclear deal with the major world powers. “The dictatorship used the funds to build nuclear-capable missiles, increase internal repression, finance terrorism, and fund havoc and slaughter in Syria and Yemen,” said Trump in a transcript of his speech posted to the White House website. Yet the president of the perpetrator of all those crimes, Iran’s Hassan Rouhani, told the same United Nations General Assembly on Tuesday that Israel is “the most daunting threat to regional and global peace and stability,” according a transcript of his remarks published by the Fars News Agency. For their part, Israel highlighted the tragic irony of Rouhani’s remarks. “#Rouhani tries to preach about morality as he funds global #terrorism, including Hamas’ terror tunnels and Hezbollah’s missiles. His words are detached from reality, and only strengthen the need to end the #Iran nuclear deal,” Israeli Ambassador to the UN Danny Danon posted to Twitter. That nuclear deal was “a windfall for Iran’s leaders,” according to Trump, who told the UN that the Iranian military budget grew almost 40 percent after the accord was signed. “Iran’s neighbors have paid a heavy toll for the region’s [regime’s] agenda of aggression and expansion. That is why so many countries in the Middle East strongly supported my decision to withdraw the United States from the horrible 2015 Iran Nuclear Deal and re-impose nuclear sanctions,” said Trump. Yet while the Iranian regime has repeatedly prophesied of the destruction of Israel, Rouhani on Tuesday accused the Jewish State of “blatantly threatening others with nuclear annihilation.” This was apparently referencing Israeli Prime Minister Benjamin Netanyahu’s vague warning to Iran of mutually-assured destruction if the Iranians ever tried to nuke Israel. Speaking of goals, Trump also has his own goal for Israel—peace with the Palestinians.